This nourishing combination of beans and vegetables is given an extra protein boost with the addition of crumbled home-made curd cheese (panir). To make this a dairy-free dish, add frozen tofu that’s been thawed and crumbled instead of the curd cheese. 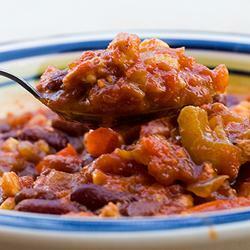 Chili is delicious served with your choice of breads or rice. Serves 6-8. Heat the oil in a heavy 3-litre/quart saucepan over moderate heat. When the oil is hot, add the minced green chili and saute for 1 minute. Add the asafoetida powder and saute momentarily. Add the diced peppers and celery. Saute, stirring occasionally, for 5 minutes or until the vegetables soften. Add the cooked corn and the chopped tomato and cook, stirring occasionally, for another 10 minutes. Add all the remaining ingredients and simmer for 20 minutes, stirring occasionally. If the chili is too thick, add some reserved bean liquid. Serve hot.